Friday Wrap-Up – News from Big Axe, Picaroons, Big Tide, Garrison Brewing, Beau’s, Schoolhouse, and much more! Happy Friday, folks! We are now officially into fall, and as such, we have plenty more autumn and harvest-themed beer news this week. • Big Axe Brewery has released their Seasonal Harvest Ale, Rusty Axe Amber Ale. Continuing Big Axe’s theme of using local ingredients in every beer, the Amber Ale was brewed with brown sugar glazed carrots, roasted squash and their own homemade brittle right in the boil. With these unique ingredients, the flavour and aroma is reminiscent of fall, with hints of vanilla, cinnamon, nutmeg and clove, built on top of a soft caramel base. It weighs in at 5.6% ABV and 28 IBUs, and is available at the brewery. • Picaroons Brewery has brewed up a new beer recently, Page Turner Session Ale. The Amber Session beer weighs in at 3.7% ABV, and the recipe features Gooseberries. It was brewed to celebrate the upcoming 60th Anniversary of Goose Lane Edition, a local publishing house. Proceeds from the sale of the beer will be donated to Laubach Literacy New Brunswick. They will be holding a launch event at the James Joyce Pub on October 3rd to celebrate its release. • Picaroons has yet another new beer that they are just releasing today. The Tabulator is described by the brewery as “a conservative Extra Special Bitter, that has been dry-hopped quite liberally with an uncountable amount of green hops”. It comes in at 5.5% ABV, and will be served almost-exclusively at the Brewtique for growler fills, with the possibility of being available on tap at a couple of bars/restaurants in Fredericton. • Indian Beach Harvest Ale from Big Tide Brewpub is on tap now! This is one of their Fresh Hop beers, using hops they picked themselves (with help from friends and family) from local winery Dunhams Run, on the Kingston Peninsula. The malt base is 2 row and caramunich malts, and the hops used were Nugget and Cascade. This 4.8% ABV caramel-coloured beer has a fairly light body, with delicate fresh hopped flavors coming through nicely. • We have some more details on the new beer, Sub_Stanchel Amber, brewed by BarNone a couple of weeks ago. This is a wet-hopped beer, with two varieties of fresh hops added to the boil: an unknown noble variety picked in Stanchel, PEI, and an equal amount of freshly-harvested Cascade from the BarNone farm. With more hops added as a dry-hop addition, this should be a fairly aromatic brew! It comes in at 5.5% ABV (exact calculated IBUs are unknown). Look for it soon at bars/restaurants in Charlottetown, and at the weekly growler night (Thursdays) at the brewery. • We mentioned the details behind the new collaboration beer between Garrison Brewing and Beau’s – Sweet Rye’d Harvest Wheat Ale – a couple of weeks ago. Well, that beer – brewed with three different hops and the Bog Myrtle herb – has been released today at the Garrison Brewery. Clocking in at 6% ABV and 40 IBUs, the beer is copper-colored and “ripe with aromas of herb and black pepper, melon and citrus fruit” according to Garrison. It should follow for a limited time only at select NSLC stores, all four private liquor stores in Halifax, and at some of the bars/restaurants in the area. • Garrison will be taking part in City Harvest v3 on October 4th, and will be turning it into a Harvest Launch, as they will be pouring the Sweet Rye’d, as well as their new Double Jack Imperial Pumpkin Ale, and their 3 Fields Harvest. The Double Jack is on the darker side of the spectrum, and weighs in at 8% ABV, and we’ll have more details on both beers next week. • Speaking of City Harvest, North Brewing will be getting in on the fun by offering discounts on growler fills and merchandise, Stubborn Goat will be selling Back Door Takeout Mac & Cheese and Cask Beer samples (no word yet on which beers), and Premier Wines will be doing beer tastings. 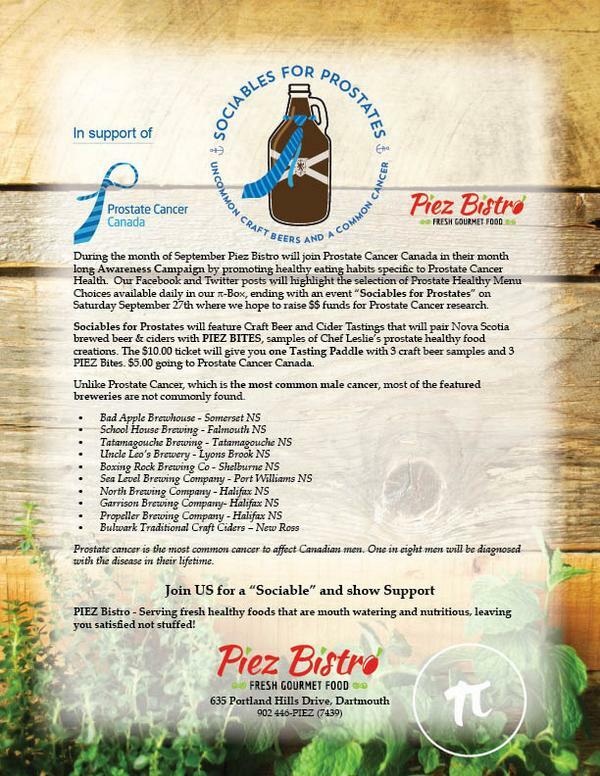 • Piez Bistro in Dartmouth is hosting Sociable for Prostates tomorrow, Sept 27th. During the event, you can purchase a tasting paddle of three different local craft beer, along with three paired pizza or other bites, for $10, with $5 of that donated to Prostate Cancer Canada. They are highlighting local craft beer, and should have a few special beers available. Check out their flyer. • One of the new beers pouring at the event will be from Schoolhouse Brewery, with a harvest beer, the first in their Hants County Hop Series. Brewed with Maritime Malt, and local hops, this series will highlight the diverse hop varieties available here. Unfortunately, hop and farmer details were not available before publishing time. We can tell you that they’ve been using a hopback at the brewery to get the most aromatics from the hops. This piece sits between the kettle and the wort chiller, and is filled with hops, so the hot wort will extract lots of aromatic compounds, but then be chilled, dissolving them into the liquid before they can volatilize. As the whole leaf hops used are not as concentrated as pellet hops, they may not have very high bitterness, but the beers will be quite aromatic. They also will look to launch growler sales at the Wolfville Farmers Market soon, stay tuned for details. • Uncorked Tours will be holding their last beer-tasting cruise for the year on Saturday, October 4th on the Saint John River, from 2:00 – 5:00 pm. Taking place once again on the Mississippi river boat Voyageur II, the cruise will be Oktoberfest-themed, featuring seasonal and Harvest ales from Picaroons, Big Tide, Hammond River Brewing, and Pump House (brewery list is subject to change), as well as Oktoberfest fare such as pretzels and sausages. Guests will be entitled to a 9-oz pour of each beer (after a short description), along with a refill of their favorite beer after all have been sampled. In between tastings, guests can socialize, enjoy the scenery, and sample the different foods available. Most breweries will have representatives present to answer questions about their beers. Tickets are $75 + HST, and can be purchased online. • Tickets for the inaugural trip of New Brunswick Beer Tours are now available! We initially reported on the tour last week and it looks like the schedule has been finalized. The all-day bus tour, River Valley Beer Tour, will be held Saturday, November 1st, and will include stops at Brasseurs du Petit-Sault, Railcar, and Big Axe (subject to change), as well as in-trip sampling of ciders from Red Rover; the tour will wrap up at 6:30 pm with more beer sampling at the King Street Ale House. Ticket prices have been confirmed at $75 + fee, and are available online. Fredericton Tourism is currently holding an online contest for two tickets; if you’re over nineteen, make sure you enter to win! • A final reminder that the next Burgers n’ Beer event in Fredericton will be held soon, and your chance to buy tickets is almost gone! Originally scheduled for September 30th, the event has been bumped a week to Tuesday, October 7th. Pairing six different sliders with six different beers/ciders, it’s held at reLiSH’s uptown location. Tickets are almost sold-out; they’re $45 each and can be purchased online. For more info on the event, check out last month’s post. • Since publishing our story on the Atlantic Canadian Beer Awards this week, another event related to the weekend has been announced: a Local Cheese & Beer Pairing Seminar run by Master Cicerone® Mirella Amato, and Mark DeWolf of By The Glass Tours. Being held Oct 4th from 2-3pm at Westin Halifax, attendees will have the chance to sample pairings of five beers with five cheeses, all from our region. Tickets are $15+fee, and are available online. • In other ACBA news, keep an eye on Stillwell’s Twitter and Facebook pages today as they open the People’s Choice voting. This is your chance to vote for your favourite Atlantic Canadian Beer (from those submitted to the ACBA). • Big news from our friends in Newfoundland! The Beerthief Special Order Beer Club are having a custom batch of beer brewed for them by Garrison Brewing. The beer will not be released until January 2015, but it will be available uniquely to the Beerthief members through their normal ordering process. In celebration of this upcoming brew, they are holding a naming and label contest, open to all members, until October 10th. Details, and a template for the label, are available here. This is just another in a series of great offerings and events that the Beerthief Mike Buhler and Tom Beckett are bringing to Newfoundland and Labrador. At almost 3000 members, the club is going (and growing) strong! Check out the latest newsletter for more exciting news. Joining the Beerthief Club is free to anyone over 19 in Newfoundland and Labrador, and will allow access to beers not otherwise available in the province. Another busy week! Be sure to drink local this weekend. Grab a pint of the newly-released Tatamagouche Lagerhosen at Lion & Bright and Stubborn Goat in Halifax, and some of the many other craft beers available in your area! The beer landscape in our region has grown extensively over the past few years, with breweries and brewpubs opening in all four Atlantic provinces. From nano brewers in the owners’ basement or garage, to larger craft breweries undergoing massive expansion, many different paths to great breweries are found in Atlantic Canada. To highlight and celebrate the high quality, diverse flavours and styles of beer from our region, the Atlantic Canadian Beer Awards are being held October 4th and 5th in Halifax. The brainchild of the Atlantic Chapter of Canadian Association of Professional Sommeliers (CAPS-AC), this BJCP-sanctioned event will see the best beers in our region rewarded for quality, consistency and experimentation. Beers will be judged in 15 main categories, ranging from light lagers to imperial stouts, with many sub-categories encompassing all styles in between. More important than being overly critical of beer flaws, or strictly defining which narrow style a beer must a part of, the judges at the Awards are featuring the diversity and quality of beers brewed in Atlantic Canada. Our region already has several Awards for homebrewers (including the Garrison Brewing Home Brew-Off and Big Spruce Brewing Home Brew Competition), however no local competitions open to commercial brewers. 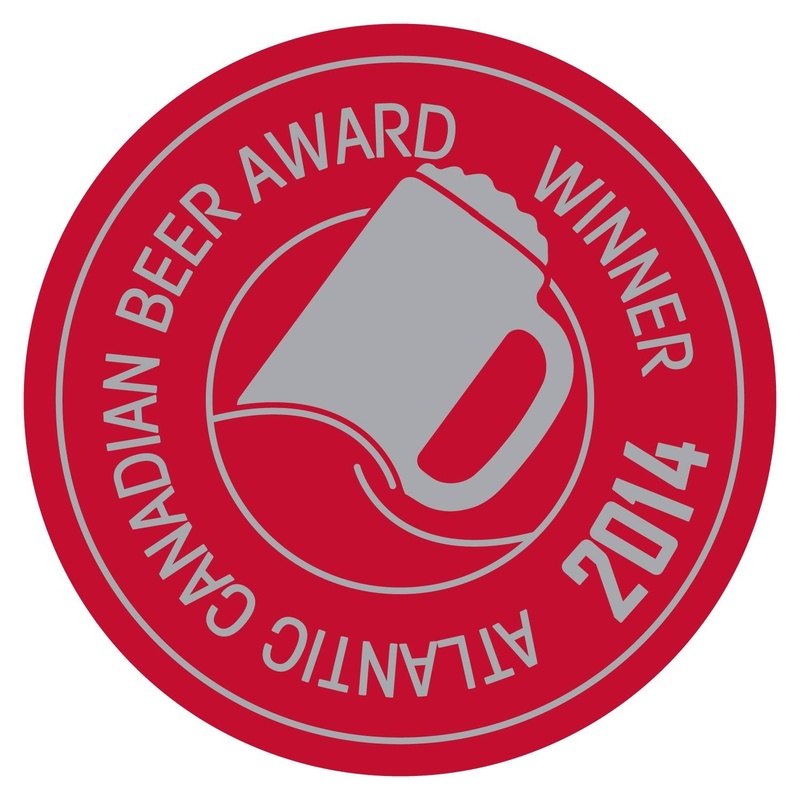 The Canadian Brewing Awards saw over 1000 beers entered in 2014, and highlighted that it was time to hold a competition locally. In addition to the 15 style category winners, outstanding brews can be nominated by judges to take home Beer of the Year honours. Breweries and Brewpubs with several excellent beers are also in the running Brewery of the Year and Brewpub of the Year, based on the performance of four previously-nominated beers. The judging will be undertaken Saturday afternoon by BJCP-certified judges and industry members from across the region, as well as special guest Master Cicerone® Mirella Amato. For more information on Amato and the Cicerone® program, please see our previous post. While in town, Amato will also be holding a Beerology seminar Sunday for CAPS-AC members and industry guests. The Awards weekend isn’t fun for only the judges, however! Once the list of submitted beer is available, Bar Stillwell will be holding a People’s Choice Award poll, where the public can choose their favourite beers from those entered. It will be tallied online, and at the bar, so stay tuned for those details Friday. What are Beer Awards, without a fun evening of celebrating and enjoying the winning beers? Sunday, October 5th, will see Amato hosting a Gala Dinner at the Stubborn Goat preceded by the awards reception held from 6-7pm. The event is open to participating breweries, as well as those members of the public who will be staying for the Beer Dinner held immediately following, also hosted by Amato, with local beers paired with some great local food from Stubborn Goat’s kitchen. The beer and food menu has been released, and we are looking forward to seeing several exciting beers on the menu that evening: Bad Apple Brewhouse Cucumber Mint paired with a Noggins Farm salad (root vegetables, feta, and gremolata), North Brewing North End Winter Saison Ale paired with scallops and apple butter, Big Spruce Bitter Get’er India Black IPA paired with duck breast and duck confit on spelt risotto, and Garrison Brewing Double Jack Imperial Pumpkin Ale paired with a dessert of Ginger Spice Cake. Tickets for the dinner are $80 (including HST and gratuity), and can be reserved via email. If you are not able to attend the beer dinner, but would still like to meet and chat with Mirella Amato, the Ladies Beer League is hosting a Book Launch for her book at Lion & Bright Monday, October 6th, from 6-8pm. Beerology: Everything You Need to Know to Enjoy Beer…Even More, is a multi-faceted approach to beer appreciation, from ideas on improving your tasting techniques, food and beer pairing ideas, and how to hold your own beer-tasting parties. Grab the book, and a pint, and talk beer with Mirella and local beer fans. For breweries looking to take part, registration for the Awards is open now, and closes this Friday, Sept 26. Beer must be received between Sept 25 and Oct 2. For the latest news and results, stay tuned to the ACBA Twitter and Facebook pages. The Atlantic Canadian Beer Awards are sponsored by The Stubborn Goat, Bar Stillwell, The Pub Magazine, Chronicle Herald and Jym Line Glassware. Presented in partnership with Tracy Phillippi (Craft Beer Experiences), Mark DeWolf (By The Glass Tours), The Brewnosers & Atlantic Canada Beer Blog.